The Nagaraja, or “Serpent King”, is a traditional figure in the Indian pantheon of naturespirits. The deity is represented in composite form: part man, part animal. The back consists of a series of reptilian coils; both the human and snake heads are missing and were originally surmounted by the hoods of a polycephalous cobra. In India, reptiles- guardians of underground treasures– were reputed to bring rain. Accordingly, the (now missing) right arm of the Nagaraja was stretched out to heaven to summon the fertilizing showers. His left hand, drawn back to his breast, probably held a bowl or chalice to catch the rainwater. 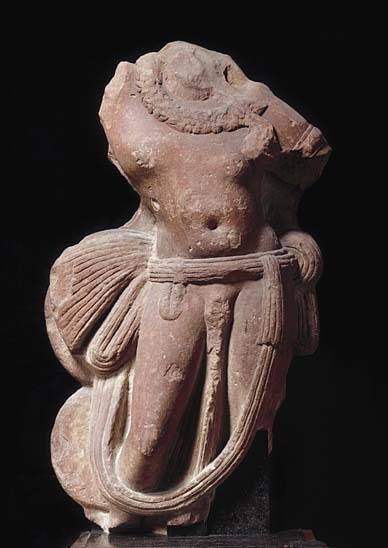 Stylistically, this figure displays all the characteristics of the Mathura style during the Kushan period (1st -3rd century CE): forcefully modelled body in the tribhanga (triple flexion) posture, hips girded with a transparent dhoti fastened by a broad cloth belt, naturalistic treatment of the abdomen, garland of flowers around the neck -echoing the ceremonial necklaces with which devotees bedecked statues of their gods- and the impression of movement accentuated by the advancing right knee and by the treatment of the belt. The Northern Indian Mathura school of sculpture, one of the country’s most flourishing, was continuously active from the 3rd century BC down to around the medieval period. The heyday of Mathura art coincided with the rule of the Kanishka dynasty, and in particular with the reign of the emperor Kanishka, a powerful sovereign and devout Buddhist. The Mathura style exercised considerable influence on subsequent styles and paved the way for the emergence of Gupta (4th-6th century) art, considered to be India’s “golden age”. http://www.guimet.fr/wp-content/uploads/2011/10/images_musee-guimet_collections_inde_nagaraja-roi-serpent.jpg 548 388 Super User http://guimet.blacko/wp-content/uploads/2017/07/logo-1.png Super User2012-01-03 15:28:532012-01-03 15:28:53Nagaraja "Serpent King"